Much of our fossil fuel energy is inefficient and produces greenhouse gases. Many of our alternative energies – wind, wave, solar – rely on intermittent sources of power. Chemical engineers play key roles in attempting to overcome these problems, Tenhaeff explained in his final lecture. For example, they’re looking for economical ways to capture and either store or reuse the carbon dioxide that comes out of coal-powered plants, albeit without much success so far. They’re studying the feasibility of huge battery banks that can store up excess solar, wave and wind power produced during peak conditions, so that it can be released to a power grid when the winds die down and the sun is obscured. They've already helped work wonders with silicon, turning sand into meticulously engineered solar panels. 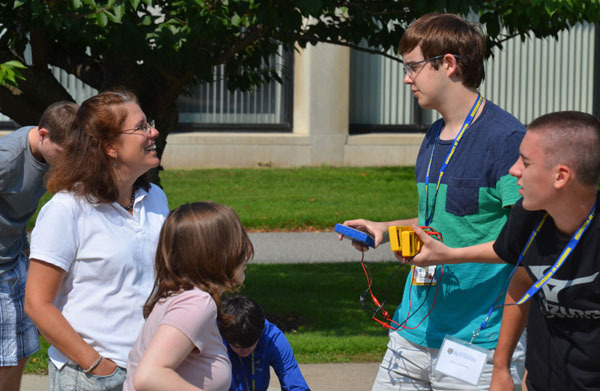 In their lab exercise, students used ammeters and voltmeters to measure the current and voltage produced by photovoltaic cells depending on the amount of shade, the distance from a light source, and the angle of light reaching the cell. 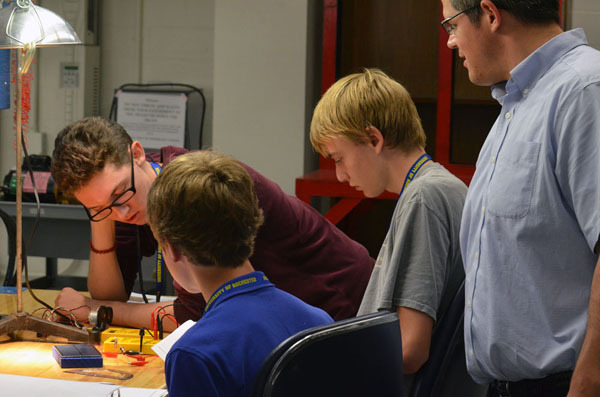 Lukas J., Adam R. and William B. track the output from their photovoltaic cell as Prof. Tenhaeff looks on. 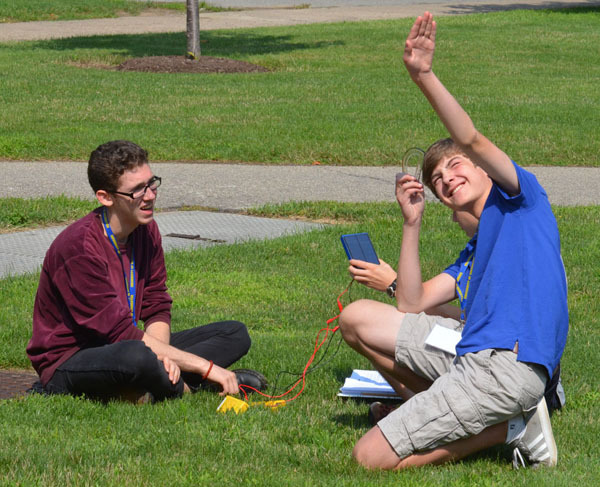 After completing experiments in the lab, students took their cells outside for some “real world” testing. Dean L. found a comfortable spot on this bench . . .
. . . while Lukas J. and William B. squint against the sun. Rachel Monfredo talks with Ian P. before the students wrap up and head back indoors.